Disclosure: This post is sponsored by Blue Diamond Almonds. All opinions are my own. Thank you for supporting companies and brands that support Floating Kitchen. I know it’s not officially Summer yet. But I’m totally in full-on Summer mode. 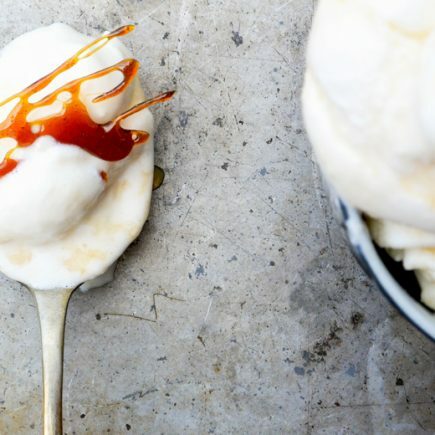 Flip flops, grilling, and drippy ice cream cones are all happening at an alarming rate. And I’m not sorry about it. But can you really blame me? I live in a seaside town. Summer is kind of our thing. It’s pretty much the reason to live here. So I’m more than happy to embrace it early on in the season…even if it’s still a little bit chilly outside. 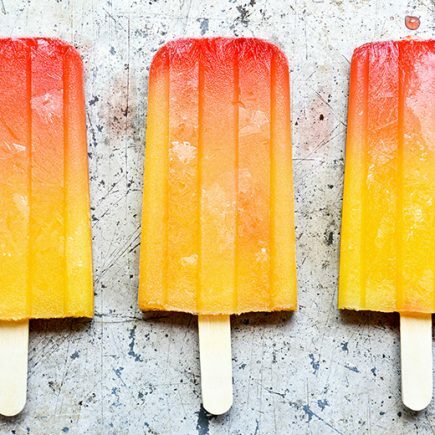 Lately I’ve been dreaming up desserts that would be perfect for Summer entertaining. To that end, I decided to turn one of my favorite recipes here on Floating Kitchen into something personal and portable. So today I present you with these very adorable individual Grilled Pineapple and Coconut Parfaits. These tropical parfaits are crazy easy to make, especially with the help of some store-bought pound cake. And they are a treat that’s light and fresh. And WHOA they are totally bringing it with the coconut flavor. 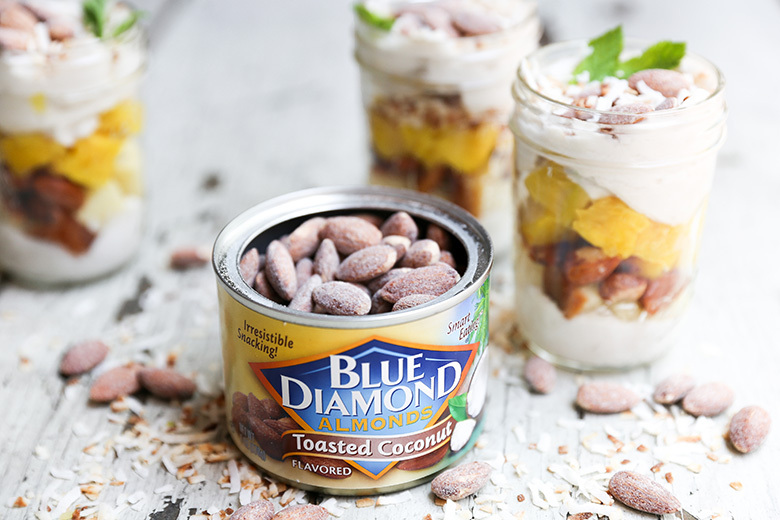 With layers of coconut whipped cream, coconut flakes and Blue Diamond’s Toasted Coconut Almonds, there is a whole lot of island-y goodness happening in each and every single jar. This is definitely a recipe for the coconut lover in your life. Full disclosure: making coconut whipped cream does take a bit of planning, because you need to refrigerate the cans of coconut milk overnight to allow for separation of the solids and liquids. Also, sometimes you get a can that is a “dud” and doesn’t separate properly. This has happened to me before and it’s very frustrating. So if you don’t want to bother with all that, you can certainly make regular whipped cream and add a small amount of coconut extract to give it a tropical boost. I used 8 ounce mason jars for these parfaits, which make for the perfect single serving size (and bonus points because they have re-sealable lids!). But any kind of glasses you have will work. Make the coconut whipped cream. Place both cans of the coconut milk in your refrigerator overnight. The next day, chill your mixing bowl and whisk in your freezer for about 5-10 minutes. Meanwhile, remove the cans of coconut milk from your refrigerator. Do not shake the cans. Remove the lids from the cans and scoop out the firm layer of coconut milk solids, being careful not include any of the liquid portion (you can discard this liquid or reserve it for smoothies). Transfer the coconut milk solids to your chilled mixing bowl. Beat on high until fluffy, about 3-4 minutes. Add the powdered sugar and vanilla extract and beat until incorporated. Transfer the coconut whipped cream to a container and refrigerate it until you’re ready to use it. Meanwhile, grill the pineapple. Pre-heat your grill to medium-high. Add the pineapple slices and cook until they start to develop grill marks, about 2 minutes per side. Transfer to a plate to cool. Once cool enough to handle, cut off and discard the rind. Cut the pineapple flesh into cubes. Assemble the parfaits. Depending on how long your coconut whipped cream has been sitting in your refrigerator, it may have firmed up slightly. If so, whisk it briefly to soften. Add about 1 tablespoon of the coconut whipped cream to the bottom of your parfait glasses/jars. Top with some of the cubed pound cake and about 1 tablespoon of the almonds. Add some of the cubed pineapple and more coconut whipped cream. Top with additional almonds and a sprinkle of toasted coconut flakes. Garnish with fresh mint leaves, if desired. Serve immediately. Oh, I’m all about the flip flops, grilling and ice cream already too Liz (even if it’s still a little cold out)! I love these cute little parfaits. I’m always looking for quick desserts for summer get together’s and you can’t go wrong with anything coconut in my book and store bought pound cake makes it even easier! Love those almonds! Thanks for sharing and have a great weekend! Thank you so much, Mary Ann! Us beach lovers gotta fully embrace Summer, right? XOXO! I’m totally jumping the gun on summer too! I can’t hold back any longer. 😉 And whoa, these parfaits are most definitely putting me in the summer mood! Grilled pineapple is LIFE! Yay yay! Glad you’re on board – both with Summer and with these desserts! I have a can of coconut milk in the fridge right now! I was going to try whipping it today! We are also in full-on summer mode and school’s not even out yet! 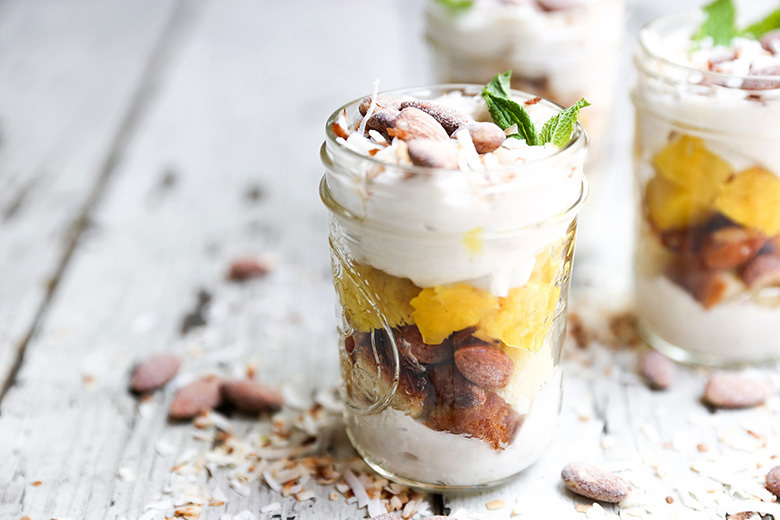 I love these grilled-pineapple-and-coconut-parfaits!!! This is like everything I love in a parfait! Looks so good! It’s hard to hold back on Summer, right? Good luck with the coconut whipped cream! Plz yes let’s get into summer mode AND coconut whipped cream = LIFE. I just can’t believe how dang good it is and paired with those almonds? Dream come true. I’m so ready for those ice cream cones and bring on the flip flops! Wish we were eating desserts together right now! Grilled pineapple is just about the best thing ever. I LOVE it! And in these parfaits with that coconut whipped cream?? Yum-o!! Such a good combination! Thanks, Ashley! Thanks, Medha! These parfaits really pack a tropical punch! LOL – loved your full disclosure, Liz.. “sometimes you get a dud” – LOL! So is life, eh? You’re in Summer mode? We were last week, now I’m back in flannel and smart wools! But this is really how it should be here.. nice a cool with highs in the low 60s. These parfaits look so good and I love how you grilled that pineapple. I would eat these for breakfast and dessert.. Those toasted coconut almonds are a delicious addition! So YUM! Thank you for this and have a great weekend! Yeah, we’ve been flip flopping a bit too with the weather. I hope Summer is finally here to stay though. I’m so ready! Cheers to the weekend, Traci!